Sweet Southern Prep | Growing up Southern is a privilege really. Hey y’all. I’m so sorry I haven’t posted lately. My classes are literally killing me this semester. Not to mention my professors always choose to pile their tests on me in the same week. I spent this past week studying for three tests. It was awful. So this weekend I went shopping for some much needed stress relief. I don’t know if y’all have ever been on Wanelo, but it’s a website dedicated to items (mainly clothing) that people post and you save the item to your page if you like it. It’s so addicting. Even more so than Pinterest. I’ve fallen in love with so many of the clothes posted on there so I decided to take a mini shopping spree this weekend and spice up my wardrobe a bit. (Follow me on Wanelo HERE to see what I love!) 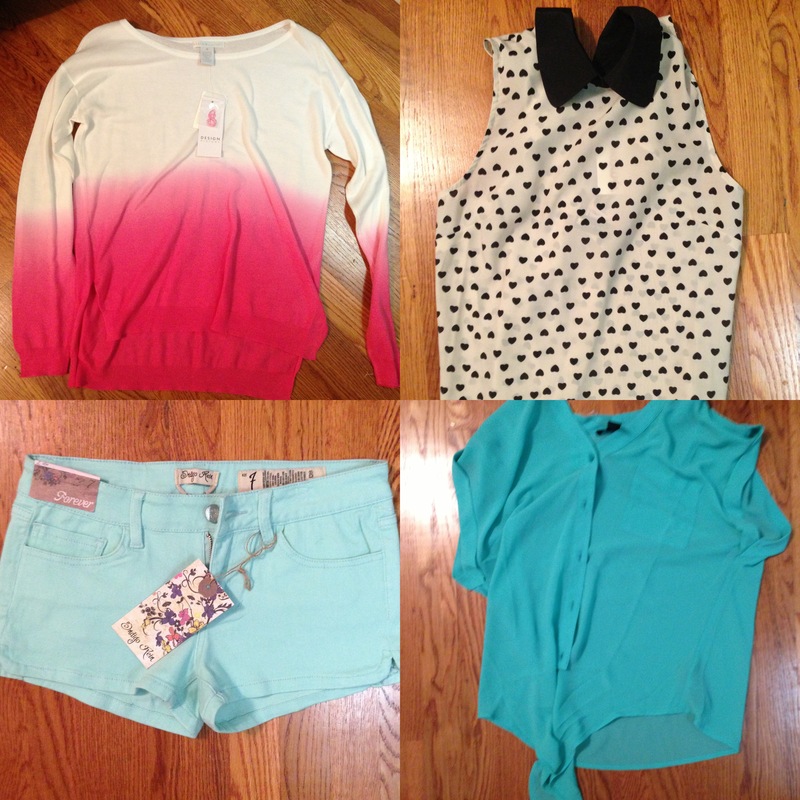 Anyways, check out the things I bought this weekend at Forever 21 and TJ Maxx! All of the items here are from TJ Maxx. If you’ve never been to TJ Maxx and you have one in your area, GO! They have brand names for 50-75% off the original price. The store in my town had so many Polo items, but I had to resist. I have too many already. Anyhow, the shirt on the top left is light purple and kind of flares out at the bottom ($14.99). The shirt on the top right is Lucky Brand and extremely comfortable ($19.99). The pants in the bottom left look much more pink in this picture than they do in real life. They look more of a bright red in person. Either way, I needed another pair of jeans badly so they were a great find ($20). The shorts in the bottom right are my favorite. They’re dip dye with lace on the front. I can’t wait for summer to get here so I can wear them! ($14.99). Everything in this photo is from TJ Maxx as well except for the shirt in the bottom right. I’ve been wanting a dip dye sweater really bad so finding this pink one in the top left today was very exciting ($20). The shirt in the top right is one of my favorites. It’s another item that I can’t wait to wear this summer ($15.99). The shorts in the bottom left were a great find because they are in my favorite color! Not to mention I lost some weight before last summer and ended up wearing shorts that were entirely too big for me the whole summer, so new shorts are a MUST this summer ($13.99). The shirt in the bottom right is from Forever 21. It’s one of those shirts that ties at the bottom in the front ($17.99). Everything in this photo is from Forever 21. The sweater in the top left is something I’ve been wanting for a while. I’ve seen so many pictures of adorable lace sweaters and now I finally have one ($19.99). 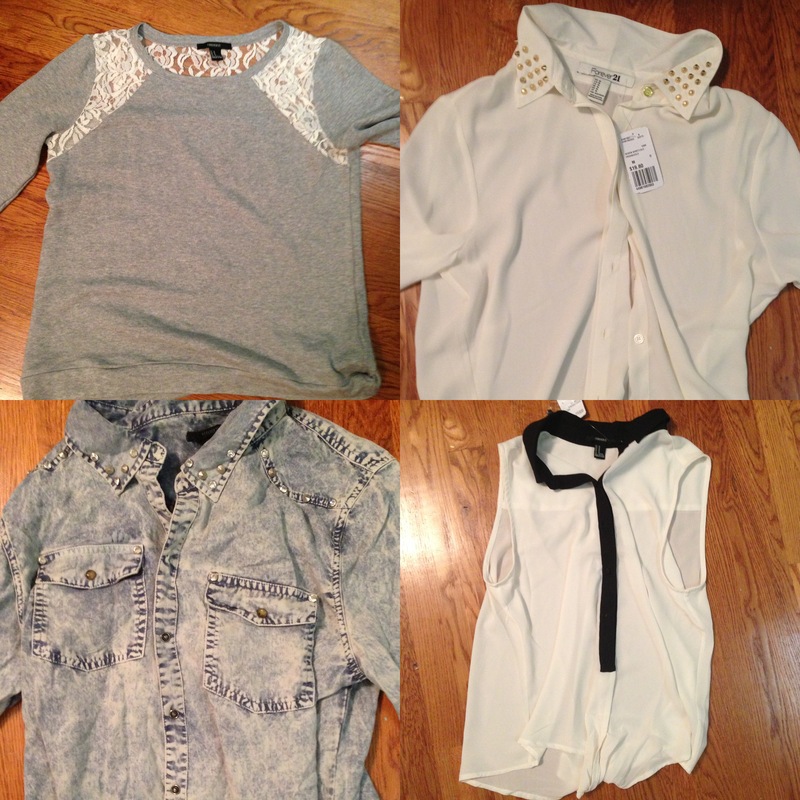 I really like the shirt on the top right because it has gold studs on the collar. I’m kind of getting obsessed with studs ($19.99). The denim button up in the bottom left is one of my favorite finds this weekend. If you can’t see in the picture, it has studs up around the collar and shoulders. I also love the acid wash denim ($29.99). The shirt in the bottom right is another cute sleeveless shirt that will have to wait until summer to be worn ($17.99). It’s not often that I get in a crafty mood. I’m generally not a very crafty person because I don’t think I’m very good at it. However, I was at Walmart the other day and saw a canvas on the arts and crafts isle. My rare crafty side took over and I bought a pack of two canvases. 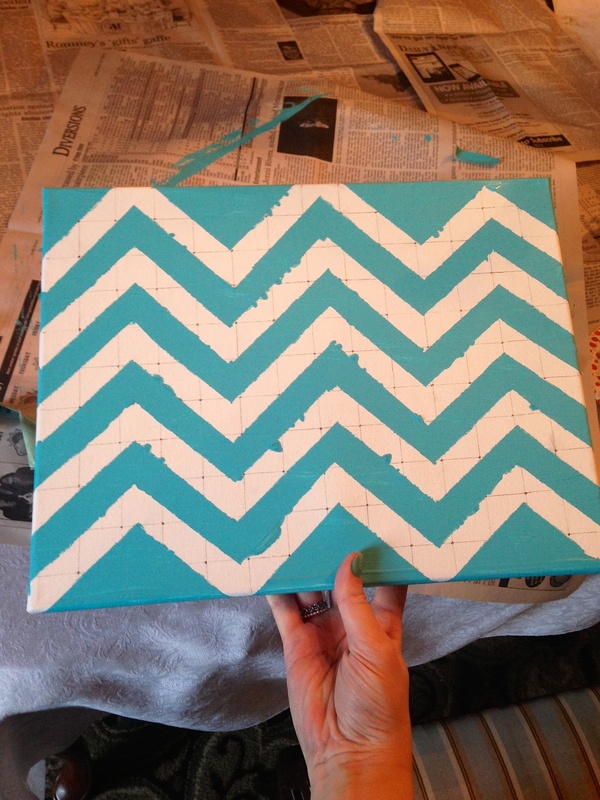 My plan was to make it into a chevron pattern like I had seen on Pinterest. So, I did. 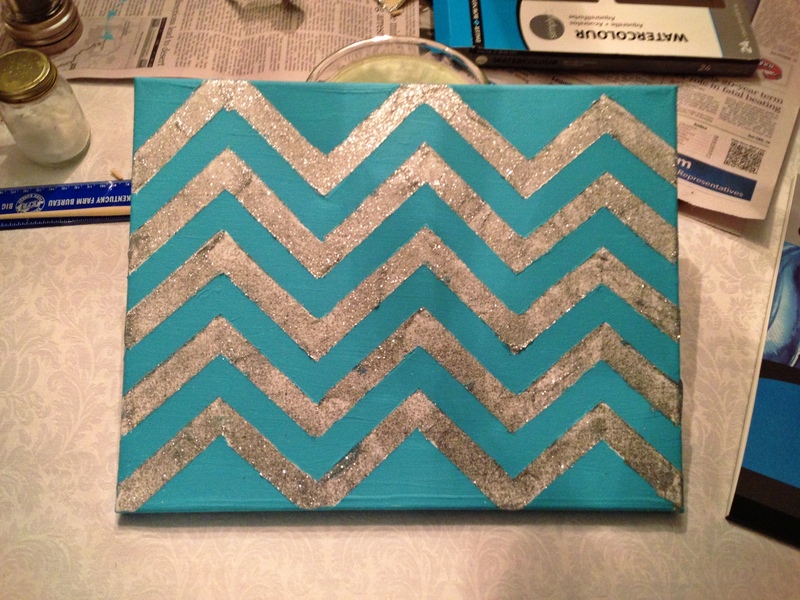 Here is the link to the tutorial I followed on making a chevron canvas. It was very helpful. She lists everything you will need to do the project. One of the items listed is artist’s paint. Let me just tell you, I have no idea what artist’s paint is. I used regular ole masking tape and it worked just fine. Also, I did not do grey and white like she did. I used aqua and silver glitter. Check out my pictures of each step below. Here is my canvas after her steps 1-4. I took a ruler and drew lines horizontally and vertically and then drew dots on the intersecting parts. 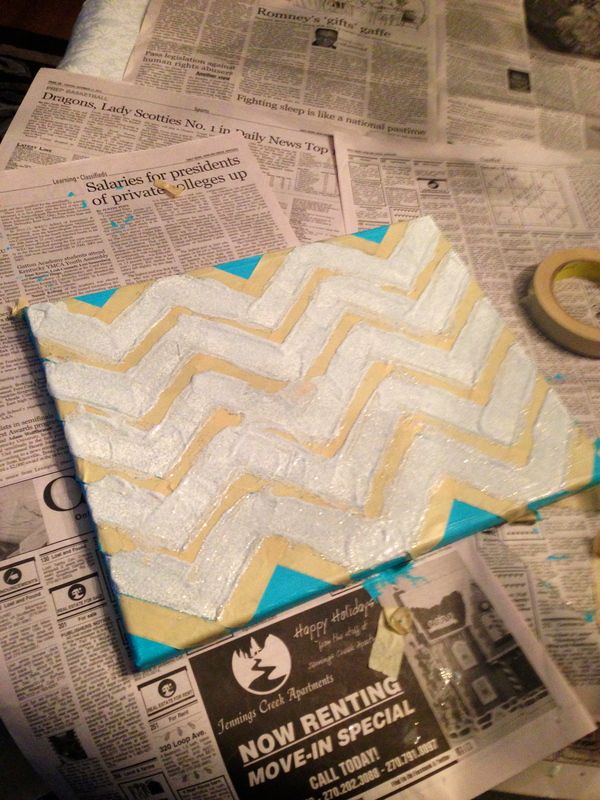 I then put the masking tape on the canvas in a chevron pattern. 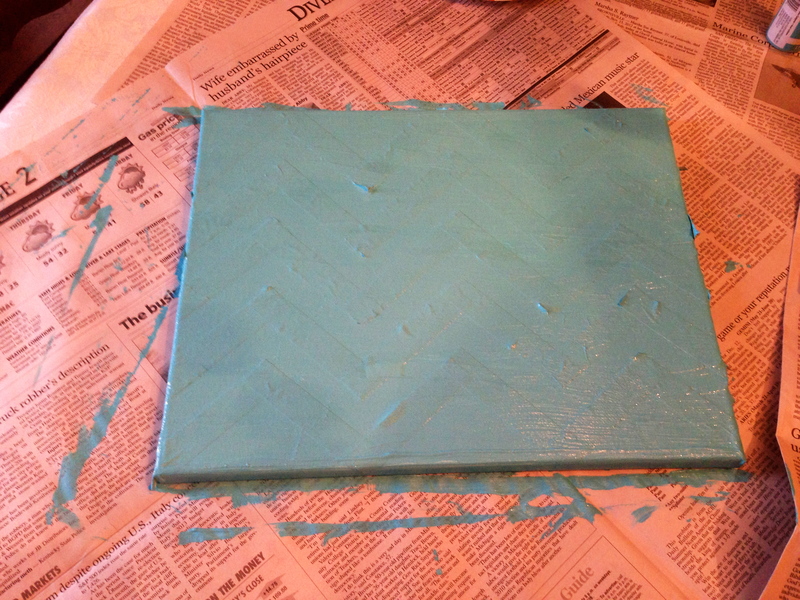 The next thing I did was completely cover the tape and canvas with the aqua paint. I used a sponge brush like she suggested in the tutorial. I let the paint dry for three or four hours and then peeled the tape off. Warning: The next picture looks rough but I promise it turned out okay! I told ya, it looks pretty bad. My mistake was not flattening the tape down enough. 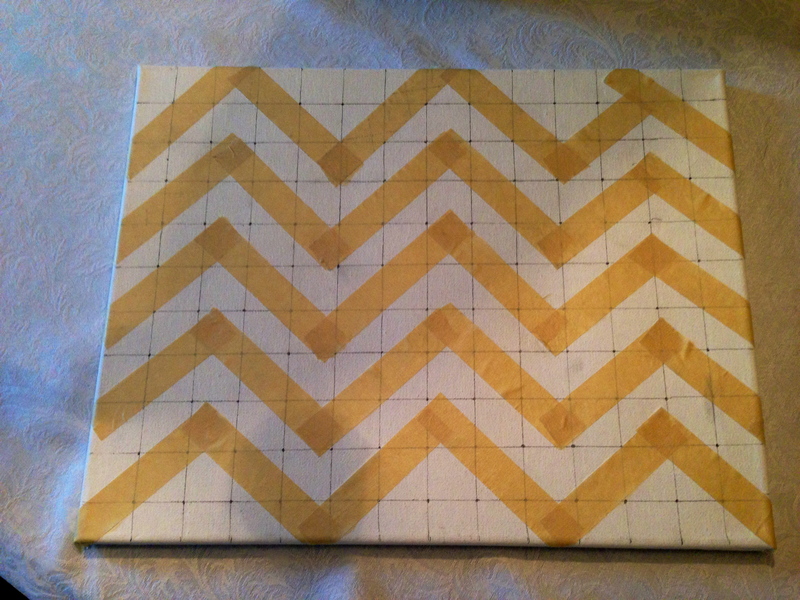 I also think that the masking tape was a bit thin, so if you decide to make a chevron canvas and use masking tape, double layer it. I did so when I painted the silver sparkles and it turned out great. This next part was not in the tutorial so I just did it the way I thought would work best. Looks pretty good, huh? (I had gone back over some of the glitter to make it thicker so that is why it looks darker in some places than others. Once it dried it all looked like the top row!) I’m proud of it though! I’ve been debating on whether to add anything else to it or not. I thought about buying some small wooden letters in my initials, painting them (not sure what color), and placing them in the middle of the canvas. I just can’t decide if I should or not. What do y’all think? I like it the way it is but I feel like it is kind of plain. I was one of those girls that started college with a set opinion on sororities. I thought that they were full of stuck up girls that paid hundreds of dollars a semester for a group of friends. When I started my freshman year I knew there was no way I was going to join a sorority. I just didn’t think it was for me. My freshman year was so boring and consisted of basically nothing. I can’t look back on it and say “I did this” or “I did that” because I really didn’t do anything. I lived at home and commuted to campus for classes. When classes were over I went straight home. I wasn’t really getting the college experience. The summer after my freshman year I decided that I wasn’t going to sit by and just “get through” college, I was going to enjoy it. I moved onto campus with a random roommate. That was a big step for me. I tend to stay in my comfort zone. Living in a dorm was already out of my comfort zone so the whole random roommate thing, not something I ever thought I would do. It turned out pretty well though. Everything started from a tweet I sent out about needing to go to the gym more now that I lived within walking distance of it. Alexis, a girl that I had grown up with but had drifted away from, suggested we go together. A few days later we did. While at the gym she told me about a sorority she had just recently joined. She had all the same skepticisms I did. She told me she never thought it would be her thing but that she was really beginning to love it. I wasn’t convinced though. We finished our work out and she asked me if I wanted to walk over to her sorority house with her and meet a few of the girls to see what I thought. Why not, right? So we walked over to the house. I met the girls that lived there and they were all so nice and welcoming. I especially hit it off with a girl named Meghan. We had a lot in common (particularly the fact that we are both big republicans! Not something you find often on a college campus). Alexis and I probably stayed at the house for about 45 minutes. As we were leaving the girls told me to come to the sorority’s ice cream party next week. They said it was just going to be a fun event to meet some of the new girls that were interested in pledging. I really liked all of the girls I met that night and it definitely got me thinking that I could possibly join this sorority. However, I still wasn’t sure. I wasn’t even sure if I was going to go to the ice cream party. Alexis and I ended up going to the party and I’m really glad I went. I met a lot of the other members and really had a great time. After the party I finally realized that this sorority may be something I want to do. Alexis and I went to dinner after the party and talked everything over. I still wasn’t 100% sure but I was definitely getting there. I can’t remember what happened exactly after this but I do remember that about 2 weeks after the party I received my bid. (I did not participate in rush or formal recruitment. I decided to join after those were over so I went through the process informally). (This is me after I received my bid from Alexis. I look bad, I know). 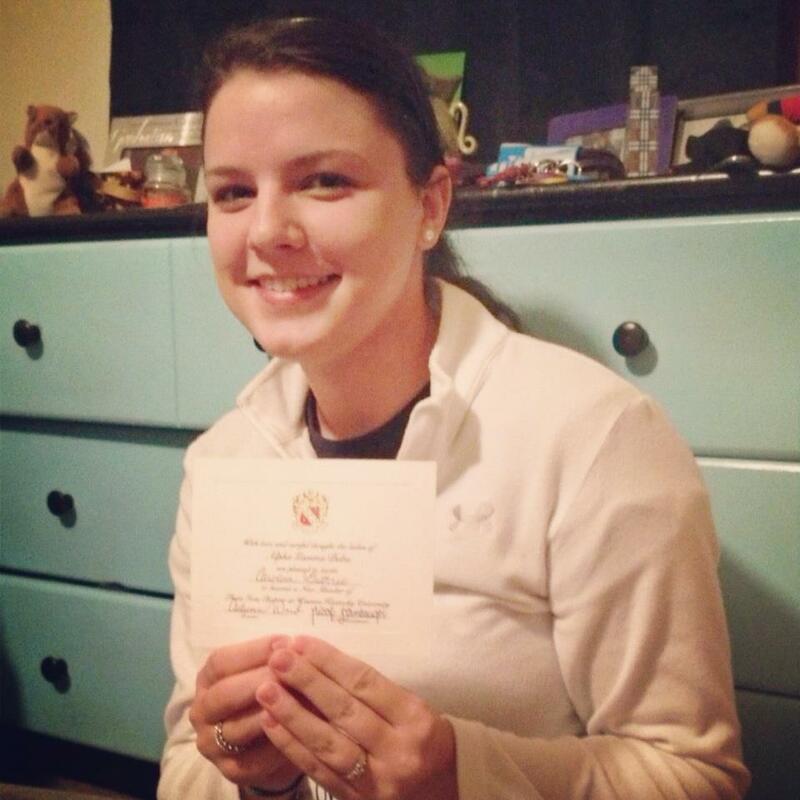 I pledged Alpha Gamma Delta at the end of September and initiated on October 27, 2012. Meghan became my Sis Mom and Alexis became my Big. I also have a Twiddle (this term means we share the same Big) named Catharine whom I have become very close to. I have met my best friends through this sorority. My preconceived notions of sororities weren’t even close to accurate. Not every girl parties, real friendships really can develop, a lot of the membership is centered around community service, it’s a great way to get involved in your university, and your friends really do begin to feel more like sisters. 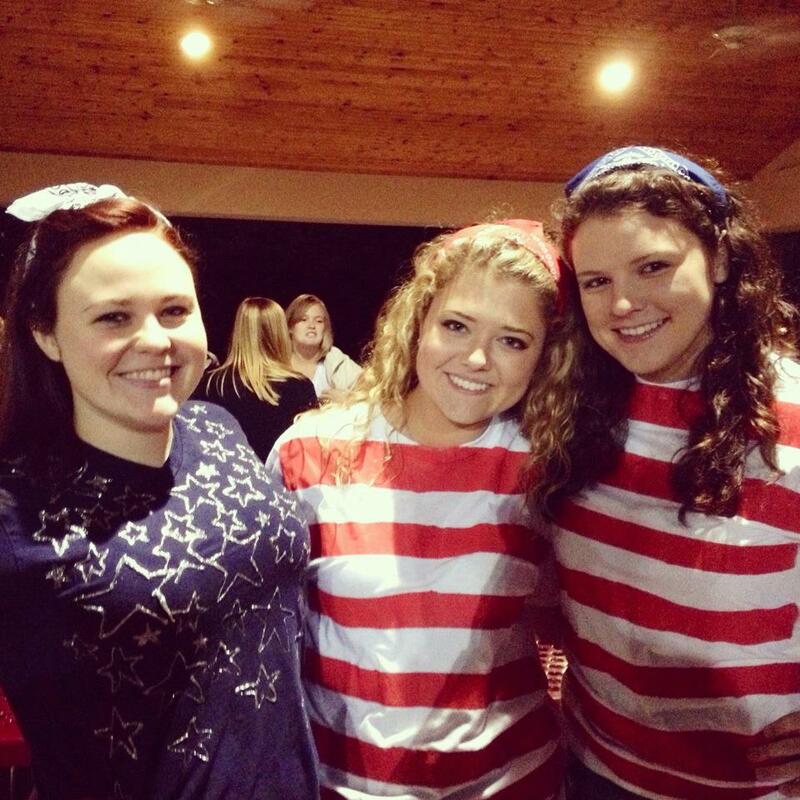 (From left to right: Alexis, Catharine, and me at Big/Little reveal). I have come out of my shell so much this year and experienced things I never thought I would. 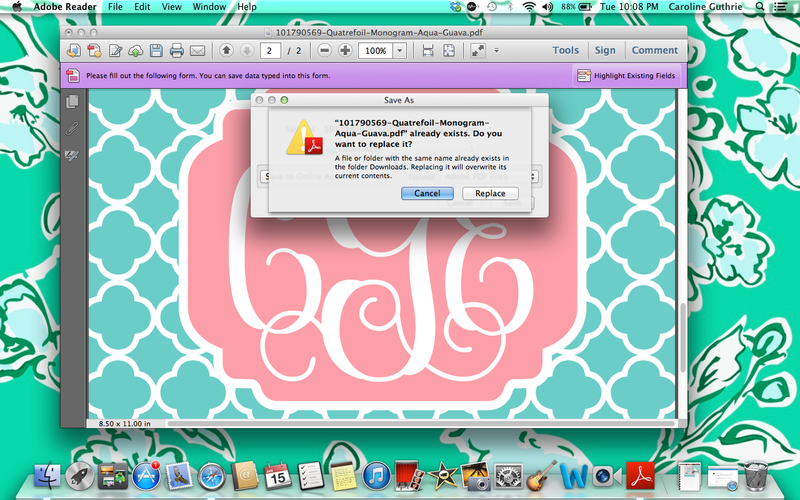 I am very happy I joined Alpha Gam. Had I not decided to move onto campus and leave my comfort zone none of this would have happened and I would be sitting at home letting college pass me by. If anyone is reading this that is skeptical about a sorority, I say just give it a try. You’ll never know how you feel about it until you do. I was originally just going to make this post about my two new letter shirts but then I got to thinking about my story and wanted to share it. However, I still want you to see my super cute shirts that I got today! Here is my new rain jacket. 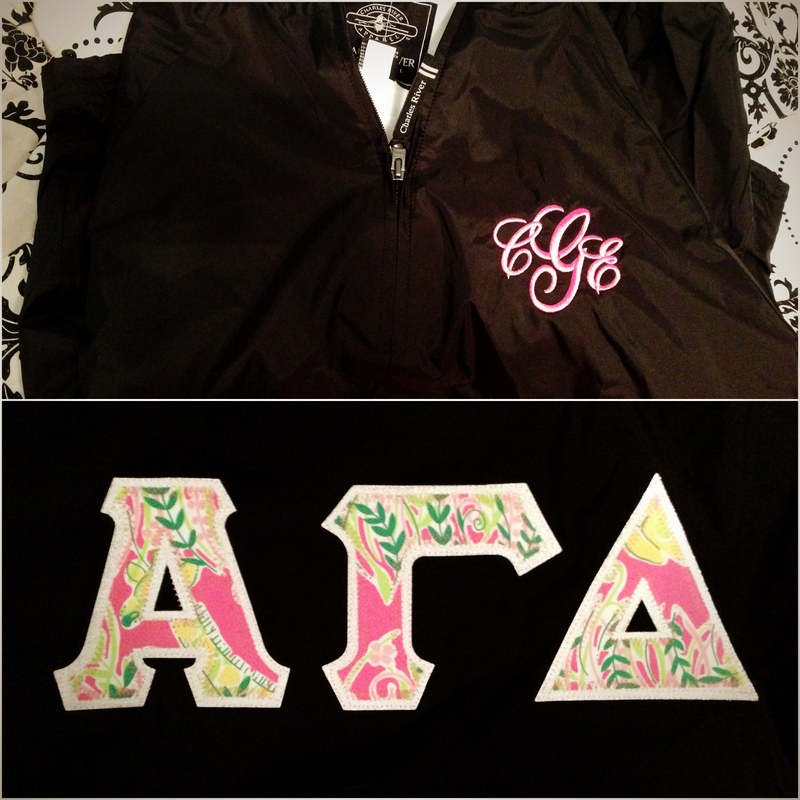 The letters are in Lilly Pulitzer fabric and the front of the jacket is monogrammed. I can’t wait for it to rain (or preferably snow) so I can wear this! I also got this crew neck sweatshirt. 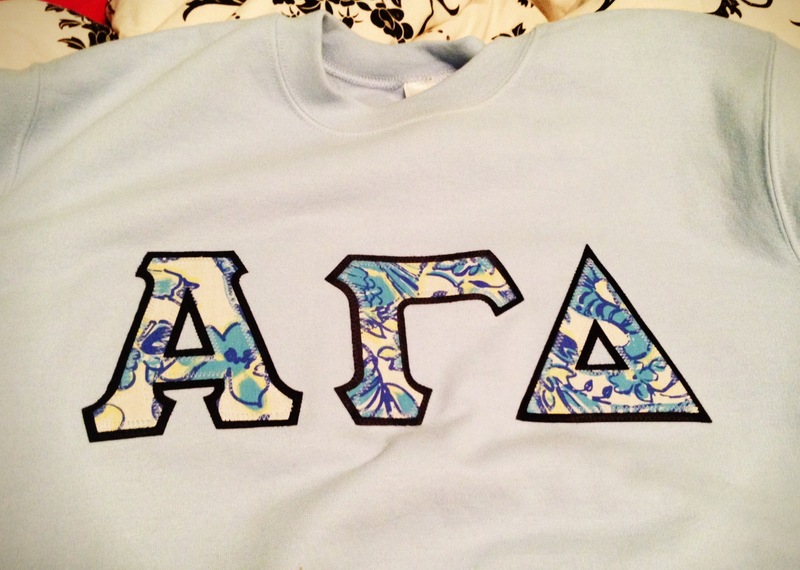 The lighting is not great in this picture, but the sweatshirt is light blue and the pattern is also Lilly Pulitzer. I love this sweatshirt so much! & as you can tell I love Lilly Pulitzer! Anyways, I’ll quit rambling. Thank you for reading my story. I highly recommend giving a sorority a try. Rush Alpha Gamma Delta if your school has it! It’s an amazing organization and you most definitely won’t regret it! I’ve been listening to this song all day. It really puts this life into perspective. This is just our temporary home. Our real home is not of this earth. It gives me peace knowing my great grandmother is in a much better place. Hey everyone! I’m really sorry I haven’t posted in a while. I’ve been extremely busy. Classes started back and I’ve been trying to get back in the swing of things. I finally declared my major. Well, actually its a double major in Mass Communication and Political Science. I’ve been stressed trying to figure that out. Also, this morning my family received some devastating news. My great grandmother passed away. She was 92 years old, almost 93. I know she is in a better place now and finally happy again. We lost my great grandfather almost 3 years ago. They were together for over 70 years and she was never the same after he was gone. I am happy knowing that they are together again, but it’s still painful to lose a loved one. I am heading down to Alabama tomorrow for the service on Monday. My heart hurts the heaviest for my grandmother (her daughter). She has been waiting on a liver transplant and therefore has not been able to travel to Alabama to see her mother often (we live in Kentucky if you didn’t know). It just breaks my heart that she didn’t get to spend the last good year with her mother, but she is at peace with the situation because she knows her mother is finally at peace and with my Papa again. But anyways, I just wanted to let you guys know why I haven’t been on lately. Things have been pretty rough. It would mean a lot if you kept me and my family in your thoughts and prayers. Thanks so much y’all. When things settle down a little bit hopefully I can start posting frequently again. I just wanted to make a quick post to say happy 3 years to my wonderful boyfriend, Ryan! These past 3 years have been incredible, crazy, and difficult with us being apart so much but I wouldn’t trade them for anything. I’m the luckiest girl in the world and I can’t believe we’ve been together for 3 years. 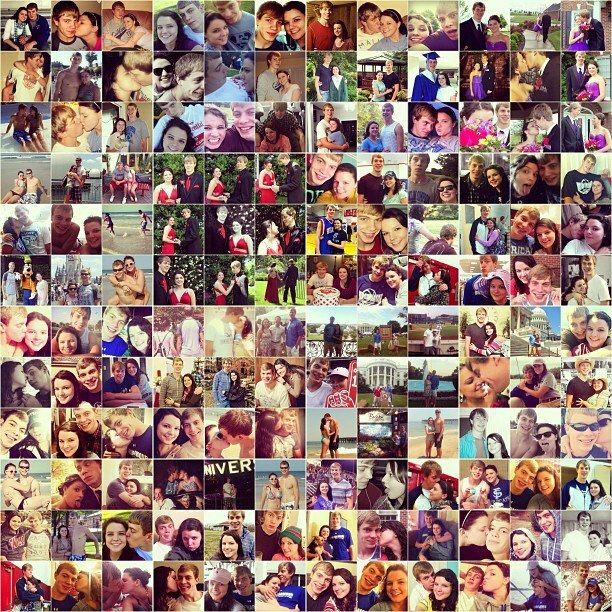 Time really does fly when you’re in love. I love you baby! 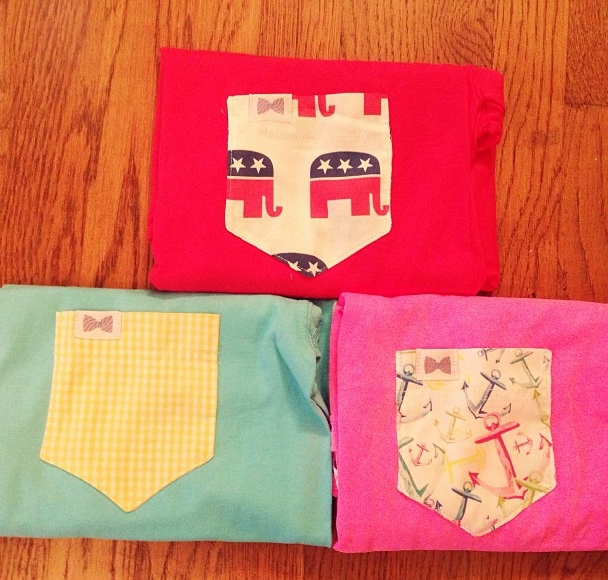 My Frat Collection shirts FINALLY arrived today and they are perfect! Seriously, I love them. I am definitely going to have to purchase more. I’m just hoping it warms up soon so I can wear short sleeves without looking like an idiot. See my shirts below. I’m sorry I haven’t posted in a few days. I’ve been extremely busy lately. I did discover something pretty cool the other day though. 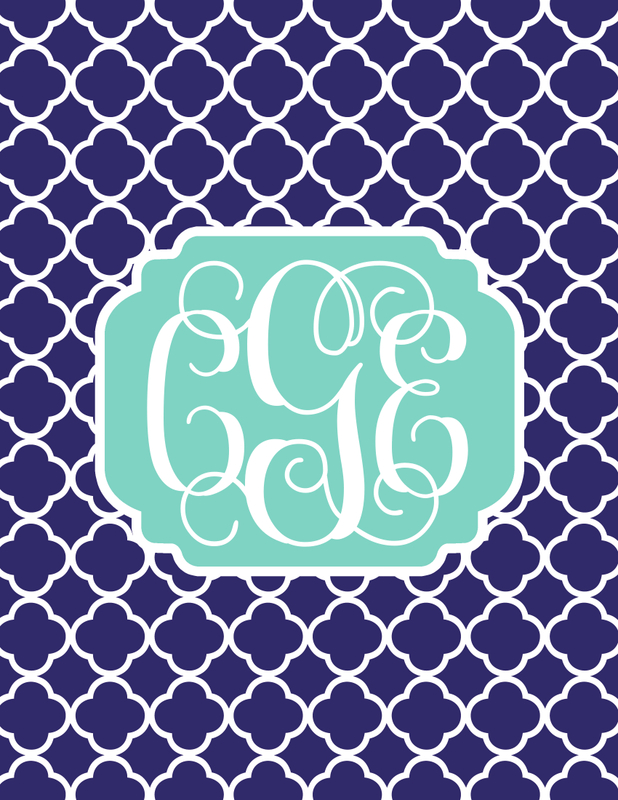 The website I have already posted about, For Chic Sake, has many different free monogram printables as you know. What you probably don’t know is that you can easily turn one of the printables into an iPhone wallpaper. Let me show you how. (This wallpaper would work on any phone but I have only tested it on the iPhone). (Photos for each step are displayed ABOVE the step). 1. Go here. 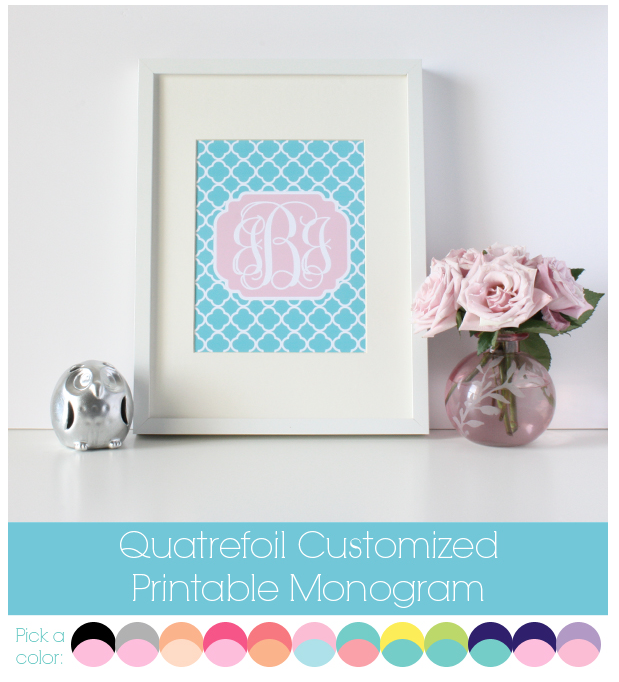 There are three different monogram prints – Script, Chevron, and Quatrefoil which you can see in the photo above. I did not attempt to turn the Script into an iPhone wallpaper because it’s a bit plain for me but it should work just the same. The Chevron and Quatrefoil turned out great. 2. Choose the one you want. I am going to choose Quatrefoil. 3. Scroll down and click on the color you would like. I chose the Aqua and Guava one. It will open up a new window on a website called Scribd. 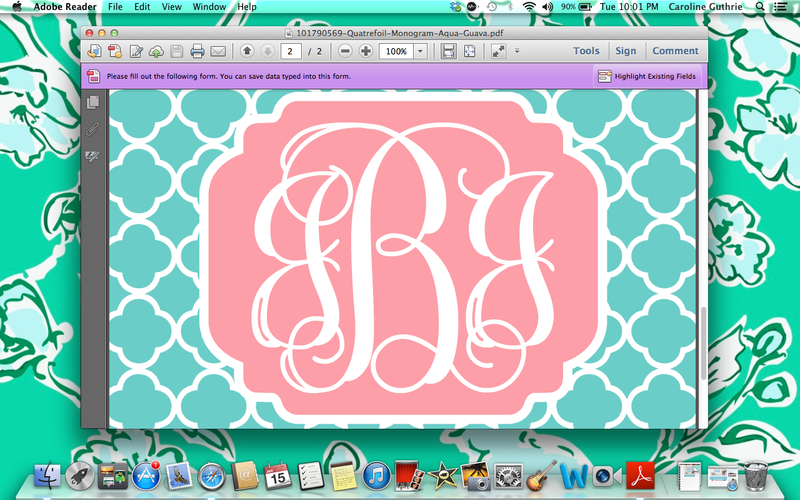 Scroll down if you would like to see what the monogram template would look like before you download it. To download it, hit download on the right hand side. It will look like the photo above. 4. 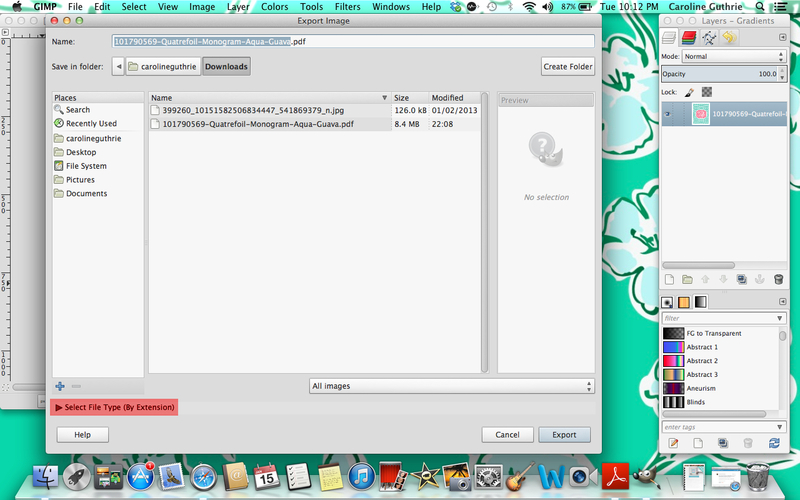 After the PDF file has downloaded, open it in Adobe Reader. (Only Adobe Reader will work, nothing else). If you don’t have Adobe Reader you can get it here. It is a free program. 5. Double click on the letters and type in your initials. Be sure to type the first and last letter in lower case and the middle letter in upper case. It should be like this – cGe. 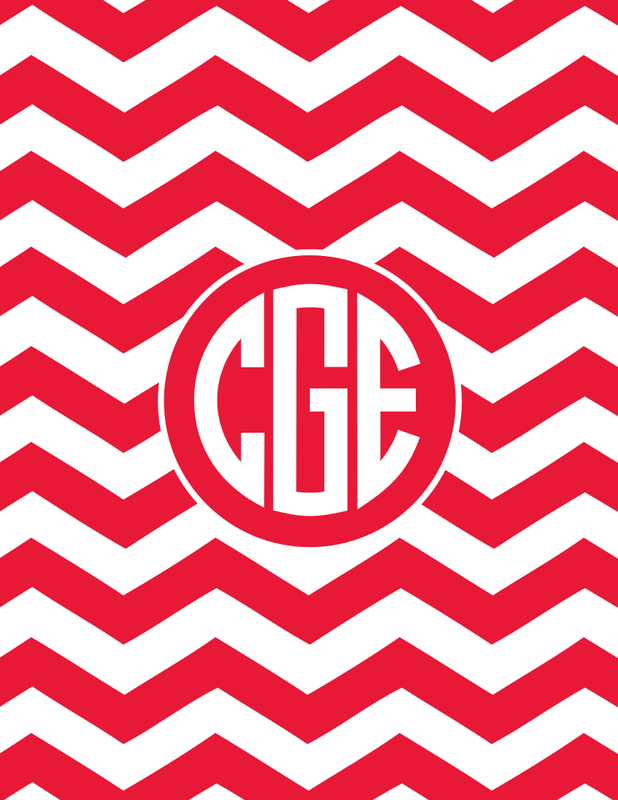 Hint: If you chose the Chevron monogram it is a bit different. You do not type in the third letter. 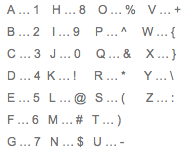 Instead you will type in a symbol that corresponds with the letter you need and it will transform it to that letter. I have no idea why they did it this way. For me, I typed in cG5 and the “5” turned into the “e” I needed. Above is the chart of symbol/letter correspondents. 6. After I changed the letters I clicked “Save as…” and hit save. It will then ask you if you want to overwrite the current file. Just hit yes or replace. Then you can exit Adobe Reader. 7. Apparently there are a couple of ways to do this step but the first way I tried did not work for me. I was following this tutorial and when I got to her step 5 it did not have that option anywhere on Adobe Reader, so I found my own way. That is why I am writing a tutorial for others, because hers did not work for me. Instead of doing what she suggested, I opened the PDF file in Gimp. Gimp is a free photo editor and can be found here if you don’t have it. 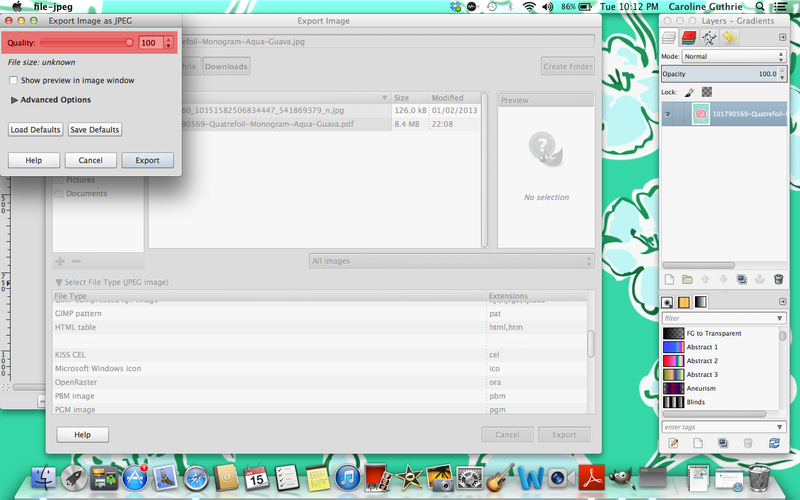 It will ask you which page you want to open in Gimp (the PDF file has 2 pages) so choose the second one. 8. 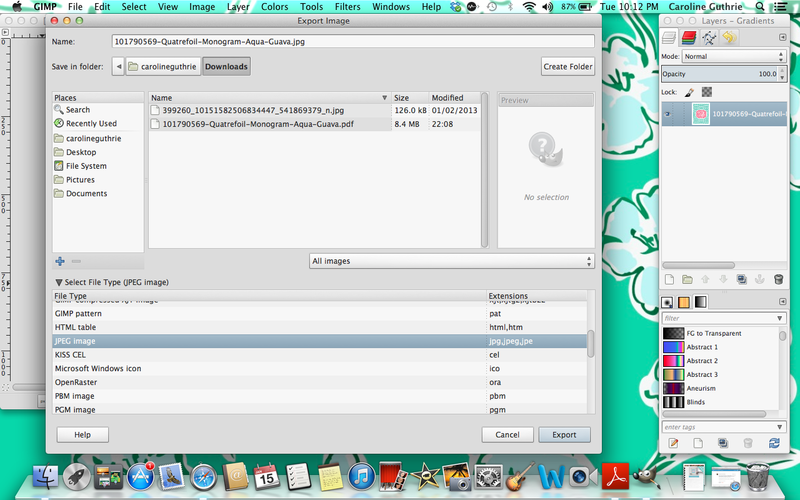 After opening the PDF file in Gimp click “File” and “Export”. 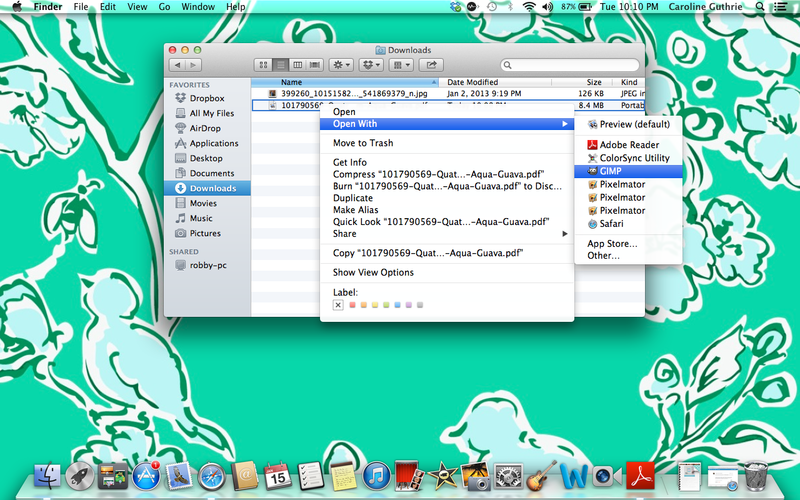 In the bottom left of the window that just opened there is something that says “Select File Extension” (highlighted in red in the photo). Click on that. 9. Hit export. A little box will pop up in the top left corner. The quality will be set on 90. Drag it to 100 if you want the highest quality for your wallpaper. Hit export again and the wallpaper is officially saved on your computer! 10. I emailed the wallpapers to myself to get them on my iPhone but you can do whatever you feel is the easiest. The wallpaper automatically centered itself for me so I didn’t have to adjust it at all. It looks pretty awesome! I really hope my tutorial helped you out. I wanna give props to the tutorial I used. Even though it did not work for me, it was very helpful and got me started. 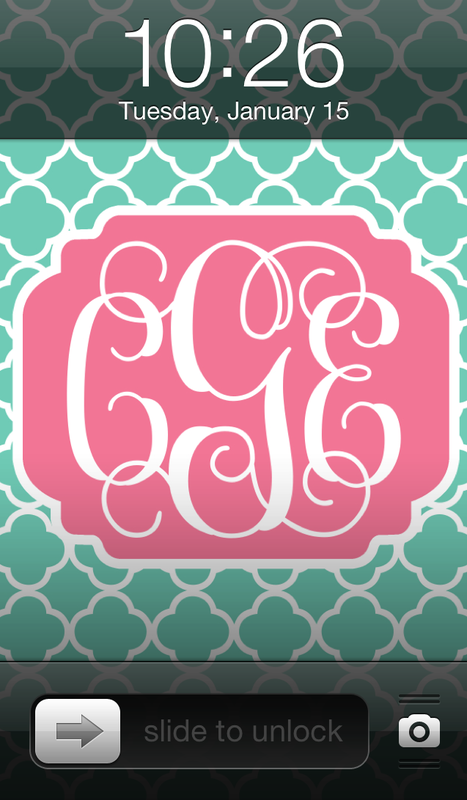 I hope you enjoy making as many monogrammed iPhone wallpapers as I did! Now, onto the main subject. 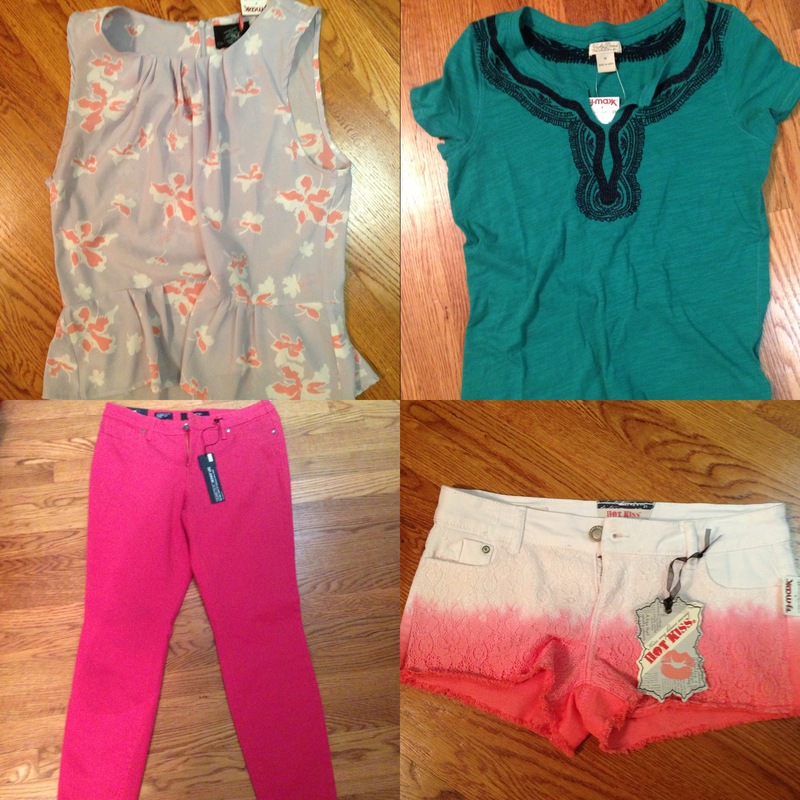 As expected, my clothes from Marley Lilly arrived yesterday and they are PERFECT. The half zip and fleece vest look amazing and I am so happy with my purchases. I wore the half zip all day and then wore the vest when I went out last night. Check them out. Here is my half zip. It looks so much better than I had imagined it would. 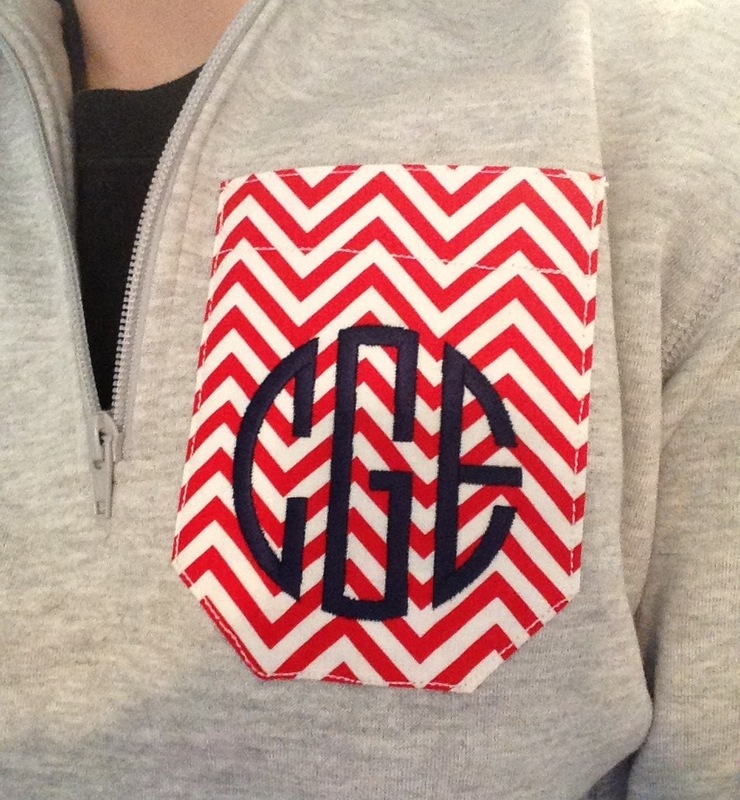 I am so happy I went with the red chevron and circle block letters. It is also super comfortable and I would definitely recommend it to any sweet southern prep. If you’re interested in one, go here. They just recently got some new patterns in so you will have even more choices than I did. Here is my black fleece vest. I wore it over a red long sleeve Polo shirt. It is so warm and looks great. I’ve never been one for vests but I can make an exception for this one. I love it and will be wearing it all the time. 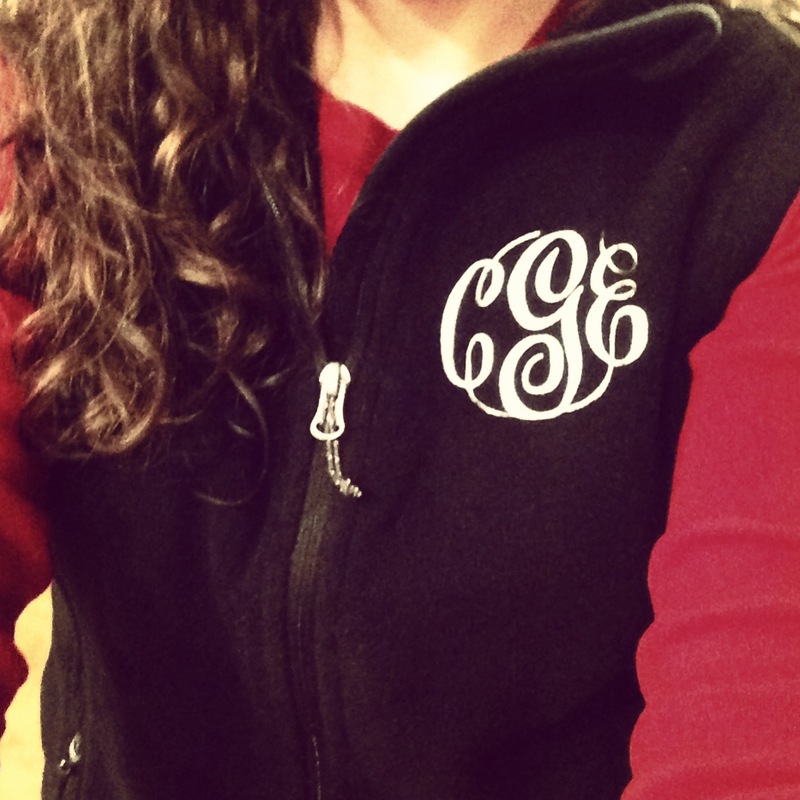 If you’re interested in a fleece vest, you can look here. So I was on Pinterest a couple of hours ago and stumbled upon this awesome website. 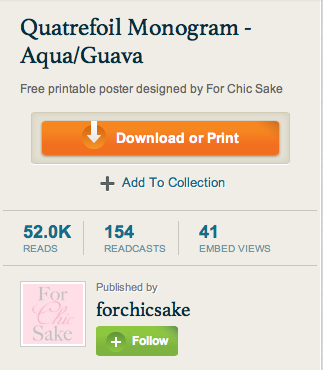 It is called For Chic Sake and they have SO many monogram printables for FREE. So what do you think I did? I went on their website and printed some things out. 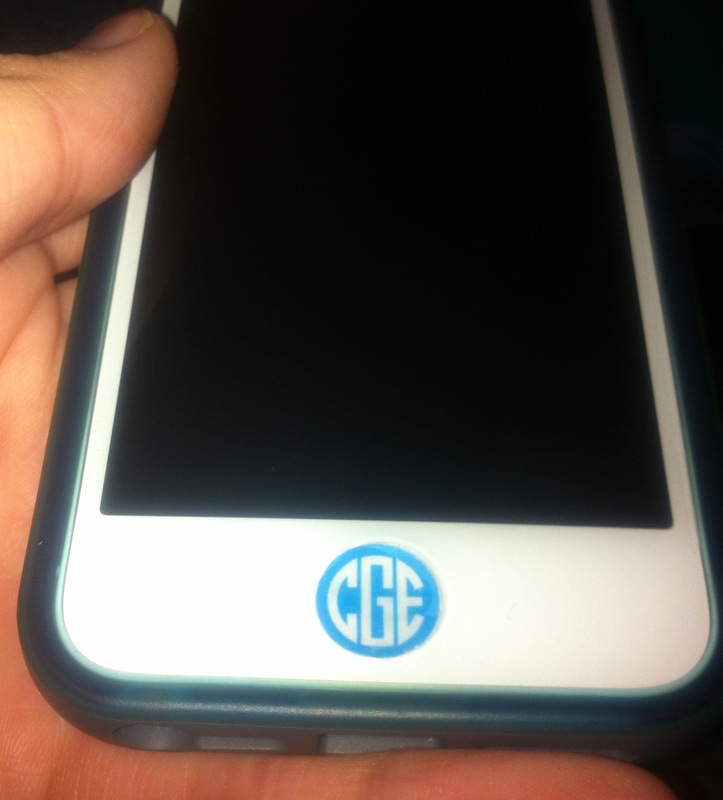 The first thing I stumbled upon were these amazing monogrammed iPhone charger wraps. It is really very easy to change the monogram on the labels and print them out. For Chic Sake gives great directions as well as a video if you’re really stuck. They recommend printing them on full sheet label paper but I didn’t have any of that with me at the time so I just printed it on regular paper. It prints out every single pattern on a single sheet of paper so you have quite a few choices. All you have to do is take some scissors and cut out the one you want. Since mine wasn’t a label I had to place a small piece of tape on the bottom of the charger but it is not noticeable at all and I think my charger looks amazing! I have another charger that I can’t wait to monogram as well. If you’re interested in giving this a shot, go here. While I was visiting For Chic Sake’s website I noticed that with the iPhone charger wraps it also printed home button stickers for the iPhone. I had some labels that I could use, but not a full sheet as suggested. Since the labels were spaced apart some of the home button monograms weren’t usable but most of them were okay. I took For Chic Sake’s advice and coated the ones I considered cutting out in a clear coat of finger nail polish. They said this would make the sticker last longer. Worth a try. I let it dry and then cut out two I thought I may use. The first one I cut out (light blue) didn’t turn out so well. Well, my cutting wasn’t so great I should say. So I tried cutting my second choice out and it turned out much better. See it below. 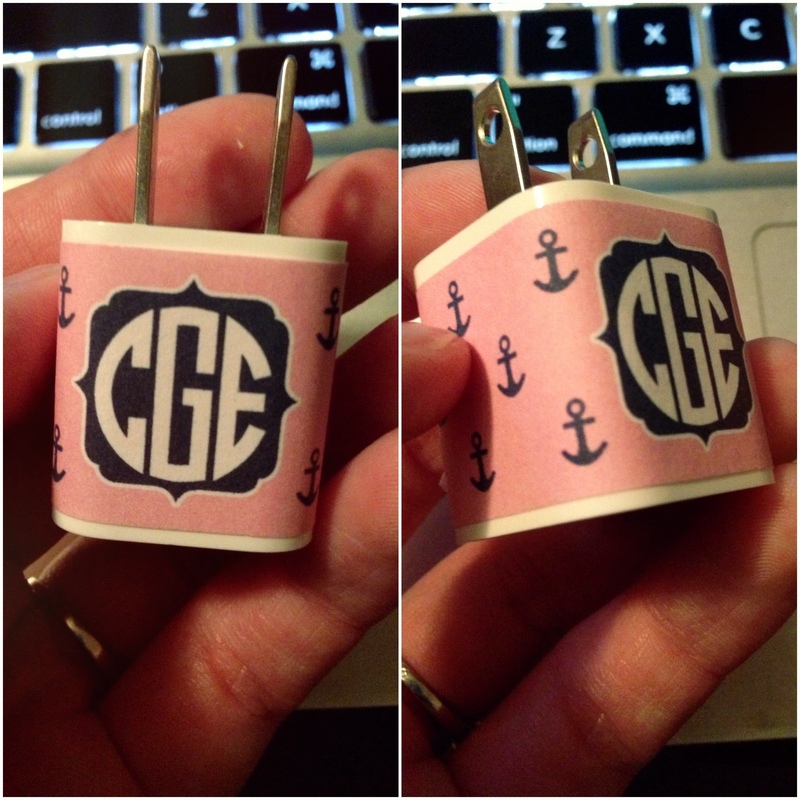 It looks awesome, but it is just a simple printed monogram on a label so it will probably not be very durable. I don’t expect it to last long at all. However, I can always print more. I thought this was pretty awesome because I’ve been wanting to add a sticker to my home button for a while but didn’t want to pay for it. You can buy monogram home button stickers from Marley Lilly for $16 (I’ll pass) but printing them for free is MUCH better. The link is the same as the one above as they print on the same sheet of paper. If you decide to attempt this, good luck! The cutting process of the home button sticker is not easy, so start on one you don’t particularly like to gain some practice. 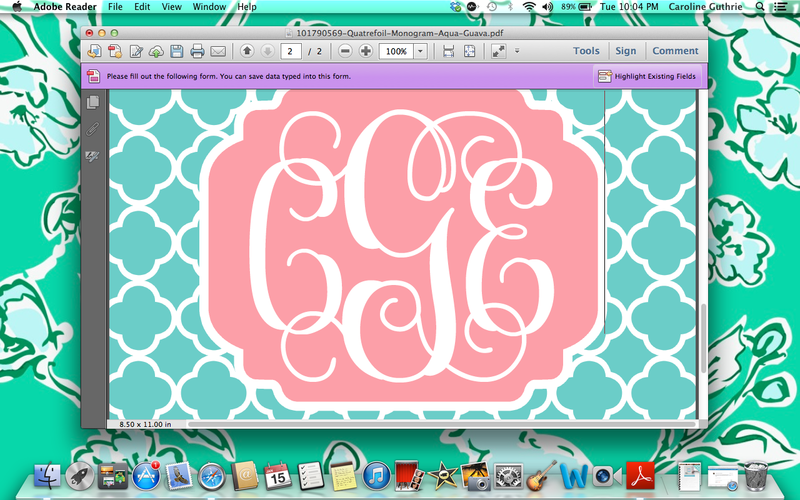 For Chic Sake’s website also has many other monogram printables that I have yet to experience with but I’m sure I will! It was a great find on Pinterest and I hope you enjoy it too.